are built to last. These motivating machines increase strength and endurance, spatial orientation, motor planning, reciprocating motor patterns and range of motion. 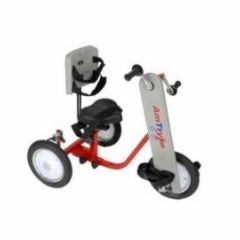 Children propel the trikes with arm and/or leg power. Fully enclosed chain drive turns pedals in ipsilateral synchrony or can be adjusted for contralateral pattern. Large - Children over 41"
Please Note: Helmet and adult supervision recommended.